I first met Tim Orr on a tour in 2006. At that time he was a graduate student at Penn State and was on the faculty for that summer’s Mont Alto seminar. The photo below is from that trip and shows Tim and Adams County Historical Society director Wayne Motts. 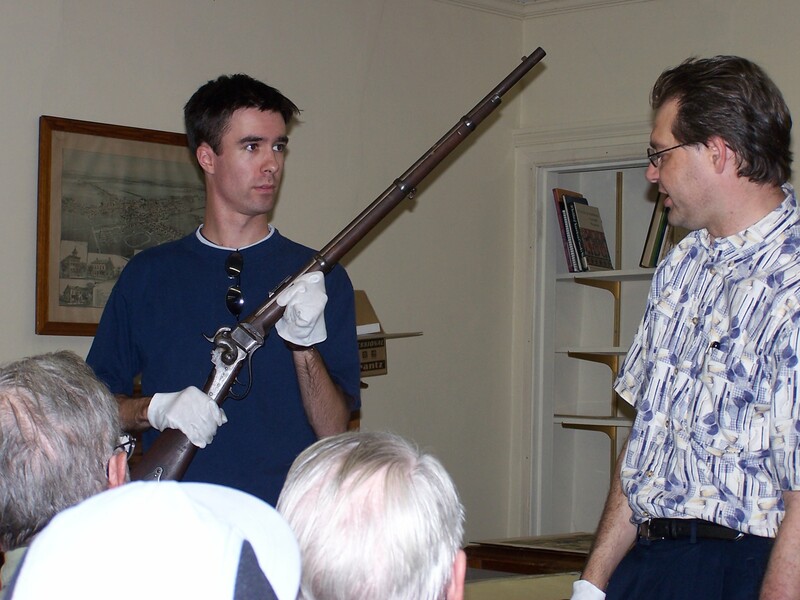 Tim had just opened his eyes after Wayne had placed an original and rare Sharps model 1859 used by Berdan’s Sharpshooters in his hands (you may be able to zoom in and see the two triggers). Tim was – and I believe still is – a Berdan’s Sharpshooters re-enactor. The look on his face when he realized what he held in his grasp was priceless: he had never been so close to one before. Now Doctor Orr has edited and annotated Last to Leave the Field: The Life and Letters of First Sergeant Ambrose Henry Hayward, 28th Pennsylvania Volunteer Infantry. I contacted him and he agreed to answer a few questions about the book for Bull Runnings. BR: Tim, can you tell the readers out there a little bit about yourself? Education, where you have worked, anything else you’ve published. TO: I’ve been a Civil War nerd since I was eight-years-old. It all started when my father put a book about the Battle of Gettysburg in my lap. I read it and I was hooked. I was mesmerized by the story of our nation’s costliest conflict. My father and I traveled to Gettysburg that year, then to Antietam the year after that. When I was ten, he and I became Civil War re-enactors. We did living history presentations at various schools and national parks, and nowadays—although I don’t dress up in nineteenth-century garb as frequently—I can still be found in my wool regalia from time to time. Although my thirst for Civil War knowledge began when I was a buff, it soon drifted toward public history and academia. In the late 1990s, I attended Gettysburg College and during the summers I stayed on campus and worked as seasonal ranger at Gettysburg National Military Park. Upon graduation, I became a Nittany Lion, joining the graduate program at Penn State University, where I earned my master’s and Ph.D., the latter coming last year in May 2010. Presently, I am an assistant professor of history at Old Dominion University in Norfolk, Virginia. Last to Leave the Field is my first book, but I’ve also published a few articles. Four years ago, I wrote an essay on Union soldiers’ anti-Copperhead resolutions. This essay got published in a delightful collection called The View From the Ground (University Press of Kentucky) edited by Aaron Sheehan-Dean. I’ve published two other essays for Gettysburg National Military Park’s scholarly seminar booklet series, and I have two other essays in the pipeline, one on the politics of promotion in the Union army and another on mutinous behavior and oath-taking in the Pennsylvania Reserve Division. BR: What brought Ambrose Henry Hayward to your attention? Who was he? TO: The Ambrose Henry Hayward collection is an assemblage of letters written by a twenty-one-year-old needle-maker who enlisted in the 28th Pennsylvania in 1861. Gettysburg College’s Special Collections Archive owns these letters, having purchased them from a rare book dealer back in 1968. I became interested in the collection during my junior year when a friend of mine who worked at the archives informed me that she was processing them. She said she had just read Hayward’s letter about the Battle of Antietam and it interested her. I asked, “He’s in the 28th Pennsylvania, right? Tyndale’s brigade?” I asked this rather offhandedly, mostly as an effort to practice my nerdy order-of-battle knowledge. “Yes,” she replied, “That’s the officer he carried from the field.” Her matter-of-fact comment surprised me. I had known that Lt. Col. Hector Tyndale suffered a wound at Antietam, but I knew nothing about the man who helped to rescue him. My curiosity awakened, I went to Special Collections and examined the letters myself. I discovered that Hayward had, in fact, dragged Tyndale from the field, while having his clothes slashed by Confederate lead, no less! Hayward’s valor saved Tyndale’s life and it seemed to me the public deserved to know his heroic story. But as I delved deeper into his letters, trying to understand more about the life of this young soldier, I became interested in the raw emotion that Hayward felt as he experienced the conflict and then also how he conveyed it to his family. I considered this—his open and honest explanation of the war’s sorrow and violence—to be the true value of his letters. The earliest letter in the collection—which was written by Hayward on April 14, 1861—declared, “They at the South are slave holders. We at the North are their slaves.” This comment intrigued me. Here was a young man, the same age as me, willing to give his life to bring America out of its “dark days,” as he described them. Right then and there, I thought the Civil War community ought to learn the full details of Hayward’s story: his enlistment during the passionate days of 1861; his rise to the rank of first sergeant; his bravery on the fields of Antietam, Chancellorsville, Gettysburg, Lookout Mountain, Taylor’s Ridge, and others; and his mortal wounding during the Battle of Pine Knob in June 1864. Although Hayward’s frequent moments of bravery enthralled me—and he participated in more reckless acts than just his rescue of Tyndale—I found it most interesting to analyze Hayward as a person caught in a world torn by violence. His story resonated more when I contextualized it as a tale of a young soldier struggling to hold onto his morals in a world gone mad. BR: What was the most surprising thing about Hayward, either in what he wrote or what you turned up? TO: The most interesting thing about Hayward was the way he wrote without censoring his inner-most thoughts. He wrote about the war as he saw it, not how he wanted it to be. This was uncommon for Civil War soldiers. Many of them shielded graphic material from their loved ones by self-censorship. Hayward departed from the customs of Victorian letter-writing. He wrote his letters as his stream of consciousness flowed from his mind to his pen. He made it clear to his parents and siblings that letters were to be written in the context of the moment, not as material presented in the “proper” vernacular. In Hayward’s opinion, he considered each and every thought unique, like a diamond of knowledge, and he believed that hiding his thoughts from his loved ones was akin to depriving them of valuable information about his feelings, even if those feelings were unpleasant. But still, despite his garrulousness, Hayward encountered trouble when he attempted to convey the depths of his emotion during those moments when he faced something altogether new and indescribable: the sorrow he felt at the loss of his friends who died in battle. As his pen and pencil scribbled and he tried to define his anguish, he deliberately cut his introspection short, telling his family that he had to repress these painful memories. This was intriguing. It is an aspect that scholars do not often see: the psychological wounds of war. Even more, I marveled at the occasional explosions of anger that appeared in Hayward’s letters. One of my favorite letters, written by Hayward in March 1863, described his irate feelings about the Copperheads, the northern Peace Democrats. Speaking of Copperhead Clement Vallandigham, Hayward wrote, “we thought we were doing much for the Great Cause, and it seemed that everywhere the work went Bravely on and that before another winter should come upon us Treason would have done its worst and this dreadfull Curse would disappear from our once Happy Country and restore us once more to our Homes and friends. but it seems that the good time has not yet come. they say the War must go on. I say let the war go on untill every traitor[,] Copperheads and all[,] are made to kneel to the Godess of Liberty. the army is yet true and Loyal but they feel as if there was not much chance for their lives with enemys on every side. I beleive that if such men as Vallandingham should come here and talk the way he does in Congress the Soldiers would kill him.” At first, I thought this was mere hyperbole, but the more I considered the importance of Hayward’s language, the more I respected the seriousness of his threat against Congressman Vallandigham and the Copperheads. Politically, Civil War soldiers lived within a frightening world of turmoil. Taking my cue from Hayward’s example, I made certain to use his letters to their fullest extent, to restore the sense of wonder and awe that came from the perspective of men who did not know how the Civil War would end. BR: What was your research and writing process for this project? Did you make any archive or battlefield trips? And how do you go about writing – how does editing letters and memoirs differ from a narrative project of your own? TO: My process in writing the book was simple. First, I transcribed the letters, leaving in the spelling errors and grammatical mistakes. Then, I made editorial changes—as few and as un-intrusively as possible—so that casual readers could read Hayward’s writing without interruption. Third, I annotated the letters, going through each sentence and looking for hidden meanings and vocabulary that required explanation. These explanations came in the form of endnotes. Finally, I broke the letters into chapters that conformed to different epochs of Hayward’s military career, writing up short introductions for each chapter in order to place each grouping of letters into an understandable contextual narrative. It seems like a short process when it gets explained, but it’s not; it took a long time to complete. Researching for an edited volume of letters was far more difficult than I imagined. In some ways, it was easier than writing a narrative project, in that, with these letters, I had a single focus: to tell the story of Hayward’s Civil War. However, to accomplish that task, I realized that I needed to tap into many different subfields of Civil War history to make sense of his letters. I am a military historian by training, so I found it easy to unravel the military jargon. However, when it came to deciphering matters related to politics, economics, or social issues, I had to extend my sphere of expertise. This required me to read more secondary and primary materials, delving into books and articles outside my comfort zone. For instance, in one of his last letters, Hayward wrote to his brother, “What makes you keep Gold up so high in N.Y.?” To an average reader, this offhand comment appears a mystery. But, to Hayward and his brother, it was an obvious reference to the New York City “gold hoax” of May 1864. So, off I went, for several days immersing myself in New York City newspapers to understand the substance of the gold hoax and then locating and reading the few articles and books that mentioned this unusual event. So, several days’ worth of reading helped me explain one sentence in one letter. On average, I annotated probably five to ten times per letter and the collection consisted of 133 letters. In addition to all the reading, I had to learn new research techniques. For instance, to piece together Hayward’s family history, I had to turn myself into a genealogist. I’d never done any genealogical work before, and while I learned plenty of helpful archival techniques at graduate school, none of them helped me decipher individual family history. In essence, plenty of my research skills had to be learned on the fly. I traveled to battlefields to see where the 28th Pennsylvania fought. I went to the Pennsylvania State Archives to look at regimental files and to the Historical Society of Pennsylvania to see related collections dealing with Hayward’s life in Philadelphia. Finally, I went to Chattanooga National Cemetery to see his gravesite. In conclusion, this Civil War letter project involved a wider breadth of knowledge than I initially expected, and honestly, I think it required me to learn a more diverse array topics about the Civil War than I could have achieved within the parameters of any academically-supervised research project. BR: How has the book been received so far? It’s probably too early for market info, but how was the peer review process: did anyone make particularly valid points? TO: The book is brand new, so there are no reviews as of yet. I “debuted” the book at Gettysburg College with a talk I delivered to the public, and the folks who came to see it received it well. The peer review process was exceedingly helpful. Reviewers saw things in a way that I did not. For instance, by the time my manuscript went to peer review, I had scrutinized each letter more than fifty times. Even though I understood the exact meaning of each sentence, I couldn’t always “see the forest through the trees,” to use a hackneyed phrase. It takes well-toned advice to get an author to view the subject matter with a different lens. For instance, in 1861, Hayward wrote about how he and his comrades stole fence rails for firewood. I knew what Hayward meant when he said that. I knew my readers would know what he meant. But it was a reviewer who alerted me to the significance of stealing fence rails for firewood. He argued that it showed, by example, the process of confiscation of southern property—the development of “hard war” to use Mark Grimsley’s phrase—on the ground. In the back of my mind, I always knew this, but I needed a push in the right direction to perceive the significance of this and other subtle processes going on. So in this case, I could easily link Hayward’s letters to the work of another historian. That was a good feeling. TO: My next business is to publish my dissertation research. While I was in graduate school, Hayward’s letters were not my top priority; my dissertation was. As it happened, the Hayward project got completed first. Right now, I’m converting my massive manuscript called “Cities at War” into something readers will enjoy. My research examines mobilization in Northern cities. I unveil the complexities that surrounded the raising of troops, the production of materiel, and the maintenance of popular support for the war on the northern urban home front. I argue that Union victory emerged, in part, from Union efforts to strengthen its mobilization processes, but contrary to myth, successful Union mobilization was never a foregone conclusion in the cities. Plagued as they were with dissent and competing visions, northern cities nearly led the North to the path of defeat. I have some other Civil War-related research projects in the works, but I plan to fill the void left by the completion of Last to Leave the Field with another “single-soldier study,” as it were, although this project will involve a different branch of service and a different war entirely. My wife and I are going to write a biography of a World War II dive bomber pilot named Capt. N. Jack Kleiss, a veteran who fought in the Battle of Midway. Kleiss won the Navy Cross and the Distinguished Flying Cross for his services in the Pacific Theater, and his well-placed bombs struck two Japanese aircraft carriers, the Kaga and the Hiryu, helping to send them to the bottom of the ocean. Last to Leave the Field has given me some perspective in recounting the life of a single person wrapped up in the turbulent forces of war, and I’m eager to interview Mr. Kleiss and take down his incredible story. Ultimately, I believe that these “single-soldier” studies are useful exercises in the craft of history. They remind us that war is a human experience. Too often, scholars are concerned only with the impact of history on rights, politics, technology, communities, nations, governments, gender, race, class, institutions, and other large-scale subjects. It’s all well and good that we historians focus on these elements, but I prefer to believe that we cannot forget the importance of history on the life of the individual. If human life has intrinsic value, then historians must strive to piece together the biographies of individuals, even if those individuals did not win everlasting fame. So far as military history goes, I’m eager to do that, to be the voice of the forgotten. We haven’t heard the last from Tim Orr. I’m confident Last to Leave the Field is just the first in what will be a long list of valuable contributions he’ll make over the course his career. Having read this interview, I was excited to spot this book at Barnes and Noble–until I saw the $52 price tag. How many people are willing to shell out such a sum for a relatively slender book unless their ancestor is listed in the index or they are deeply interested in the 28th Pennsylvania? Mr. Orr has been ill-served by his publishers.